In the spring when water temperatures start to rise, rainbow trout that have spent several years at sea traveling hundreds of miles from home manage, without maps or GPS, to find their way back to the rivers and streams where they were born for spawning. In a study published April 26, 2017 in Biology Letters, researchers have identified genes that enable the fish to perform this extraordinary homing feat with help from Earth's magnetic field. Generated by the flow of molten metal in its core, the Earth's magnetic field ranges from a mere 25 microteslas near the equator to 65 microteslas toward the poles—making it more than a hundred times weaker than a refrigerator magnet. Diverse animal species can detect such weak magnetic fields and use them to navigate. First identified in birds in the 1960s, this sense, called magnetoreception, has since been documented in animals ranging from bees and salamanders to sea turtles. But despite more than half a century of research, the underlying molecular and cellular machinery remains a mystery. 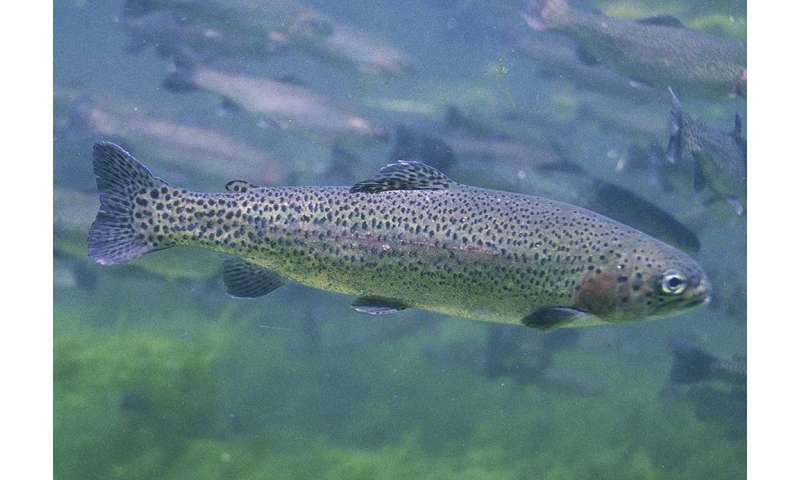 To work out the genetic basis, Duke University postdoctoral associate Bob Fitak and biology professor Sönke Johnsen and colleagues investigated changes in gene expression that take place across the rainbow trout genome when the animal's magnetic sense is disrupted. In a basement aquarium on the Duke campus, they randomly scooped up one fish at a time from a tank into a small holding container, and placed the container inside a coil of wire. The coil was connected to a capacitor, which discharged an electric current to create a split-second magnetic pulse inside the coil, about 10 times weaker than the magnetic field generated by an MRI machine in a hospital. Next the researchers sequenced all the gene readouts, or RNA transcripts, present in the brains of 10 treated fish and 10 controls to find out which genes were switched on and off in response to the magnetic pulse. Disrupting the fish's internal compass with the magnetic pulse triggered changes in 181 out of the roughly 40,000 genes they examined. Notably, the brains of treated fish showed increased expression of genes involved in making ferritin, a protein that stores and transports iron inside cells. Treated fish also showed changes in genes involved in the development of the optic nerve. "The results suggest that the detection system is based on iron that may be connected with or inside the eyes," Johnsen said. The findings are consistent with the idea, first proposed nearly 40 years ago, that animals have tiny magnetic particles of an iron-containing compound called magnetite in their bodies. The magnetite particles are thought to act like microscopic compass needles, relaying information to the nervous system by straining or twisting receptors in cells as they attempt to align with the Earth's magnetic field. "You can think of them as mini magnets that the body's cells can sense," Fitak said. Magnetite has been found in the beaks of birds, the brains of sea turtles, the tummies of honeybees, and the nasal passages of rainbow trout. Other studies have even found minuscule amounts of magnetite in the human brain, but recent research suggests most of it comes from air pollution rather than occurring naturally, and it's unclear whether they give humans a subconscious magnetic sense. The researchers suspect the iron-binding ferritin protein may be involved in repair when the fish's magnetite-based compass is disrupted or damaged. Next they plan to do similar experiments with other tissues, such as the retina, and additional species that live in the ocean but travel to their freshwater hatching grounds each spring to spawn, such as American shad. "Scientists don't know what proteins might be involved in magnetite-based magnetoreception, but now we have some candidate genes to work with," Fitak said.